The visionary behind the million-strong IF:Gathering challenges Christian women to discover what it means to do life with God rather than always striving to impress him, in this trade paperback edition of her perspective-shifting work, which now includes bonus material to enhance your book club experience, including discussion questions and easy-to-create recipes. All too many of us struggle under the weight of life, convinced we need to work harder to prove to ourselves, to others, and to God that we are good enough, smart enough, and spiritual enough to do the things we believe we should. * Find freedom from self-induced pressure by admitting we’re not enough—but Jesus is. * Admit our greatest needs and watch them be filled by the only One who can meet them. * Make it our goal to know and love Jesus, then watch what He does in and through us. As you wade into the refreshing truth of the more-than-enough life Jesus offers, you’ll experience the joyous freedom that comes to those who are determined to discover what God can do through a soul completely in love with Him. 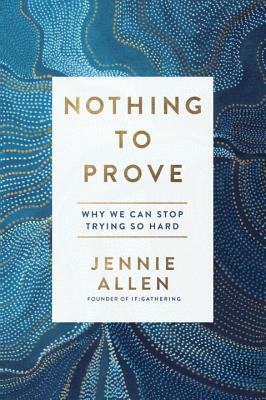 “These pages are what your soul is begging for"
Jennie Allen is a recovering achiever who is passionate about Jesus. She is the best-selling author of Anything and Restless, as well as the founder and visionary for the million-strong IF:Gathering, which exists to gather, equip, and unleash the next generation to live out their purpose. Jennie speaks frequently at conferences such as Catalyst and Q. She holds a master’s degree in biblical studies from Dallas Theological Seminary and lives in Austin, Texas, with her husband, Zac, and their four children.